6753. Clarence Gibbs EDSON [scrapbook] 1, 2, 3, 4 (Mary Edna GIBBS , Lavina Emma BITLER , Solomon , Samuel , Michael , Johannes ) was born on 17 Oct 1914 in Vineland, Cumberland Co, NJ. He died on 24 Dec 2000 in South Jersey Hospital-Newcomb, Vineland, Cumberland Co, NJ. He was buried on 27 Dec 2000 in Siloam Cemetery, Vineland, Cumberland Co, NJ. Clarence resided in 1920 in 738 Wood St, Vineland, Cumberland Co, NJ. He resided in 1930 in 738 Wood St, Vineland, Cumberland Co, NJ. He was issued a social security number before 1951 in NJ. He worked as U S Army - Master Sergeant from 1937 to 1967. He resided in Nov 1989 in Vineland, Cumberland Co, NJ. He resided in Dec 1997 in Vineland, Cumberland Co, NJ. He resided in Dec 2000 in Vineland, Cumberland Co, NJ. He served in the military with U S Army in WW II. He served in the military with U S Army in Korean War. He served in the military with U S Army in Vietnam War. He was a member of First United Methodist Church - Member in Vineland, NJ. He was a member of American Legion in Vineland, NJ. Clarence married Alice Marguerite SCHNEIDER on 17 May 1941 in Plymouth, Plymouth Co, MA. 12037 M i Gibbs EDSON. Clarence also married 1 Georgia HAMILTON [scrapbook] 1, daughter of William Harry HAMILTON and Emma BROWN. Georgia was born on 23 Jun 1893. She died in 1972. She was buried in Siloam Cemetary, Vineland, Cumberland Co, NJ. 6754. 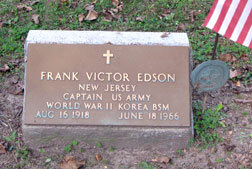 Frank Victor EDSON [scrapbook] 1 (Mary Edna GIBBS , Lavina Emma BITLER , Solomon , Samuel , Michael , Johannes ) was born on 16 Aug 1918 in Vineland, Cumberland Co, NJ. He died in Jun 1966 in Vineland, Cumberland Co, NJ. Frank resided in 1920 in 738 Wood St, Vineland, Cumberland Co, NJ. He resided in 1930 in 738 Wood St, Vineland, Cumberland Co, NJ. He served in the military with U.S. Army - Captain in WW II, Korea. Frank married Marguerite Selma BITTERS. 12038 F i Living EDSON. 6755. Lois Mary GIBBS 1, 2 (Robert Addison GIBBS , Lavina Emma BITLER , Solomon , Samuel , Michael , Johannes ) was born on 9 Oct 1923 in Vineland, Cumberland Co, NJ. She died on 13 Aug 1999 in NJ. Lois resided in 1930 in Landis Twp, Cumberland Co, NJ. She was issued a social security number before 1951 in NJ. She resided in Aug 1999 in Bridgeton, Cumberland Co, NJ. Lois married 1 Robert James DAPP 1, 2, son of Sylvester DAPP, on 24 Sep 1947. Robert was born on 27 Jan 1923. He died on 23 Apr 2002 in S.J.H. Newcomb Division, Vineland, NJ. Robert graduated from Glassboro High School in 1941 in Glassboro, Gloucester Co, NJ. He was issued a social security number before 1951 in NJ. He served in the military with U.S. Army Air Force - B29 pilot in WW II. He worked as design engineer with Kimble Glass Co in Vineland, Cumberland Co, NJ. He worked as partner with Dapp Real Estate and Builders in 1962. He resided in Apr 2002 in Vineland, Cumberland Co, NJ. He was a member of Vineland Planning Board. He was a member of South Jersey Home Builders Association. He was a member of Cumberland County Board of Realtors (president). + 12039 M i Robert Gregory DAPP. + 12040 M ii Richard Walter DAPP. 6756. Living GIBBS (Richard Eugene GIBBS , Lavina Emma BITLER , Solomon , Samuel , Michael , Johannes ). 12041 F i Living GIBBS. 12042 F ii Living GIBBS. 6757. Living GIBBS (Richard Eugene GIBBS , Lavina Emma BITLER , Solomon , Samuel , Michael , Johannes ). 12043 M i Living O'DOWD. 12044 M ii Living O'DOWD. 12045 F iii Living O'DOWD. 6758. Barbra Jean GIBBS 1 (Richard Eugene GIBBS , Lavina Emma BITLER , Solomon , Samuel , Michael , Johannes ) was born on 22 Sep 1936 in Glenridge, NJ. She died on 13 May 1971 in E. Hanover, NJ. 12046 F i Living KASLANDER. 12047 F ii Living KASLANDER. 12048 M iii Living KASLANDER. 12049 F iv Living KASLANDER. 6761. Charles Whitman BITLER Jr [scrapbook] 1, 2, 3, 4, 5 (Charles Whitman , Edwin Charles , Solomon , Samuel , Michael , Johannes ) was born on 21 Aug 1949 in OH. 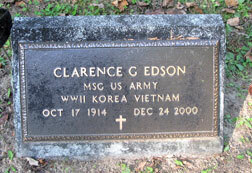 He died on 20 Apr 2009 in Ocean Springs, Jackson Co, MS. He was buried in Sec D Site 676, Biloxi National Cemetery, Biloxi, Harrison Co, MS.
Charles resided in 1977 in San Diego, San Diego Co, CA. He served in the military with U. S. Navy until 1888 in Vietnam. He resided from 1990 to 2009 in Gautier, Jackson Co, MS. He worked from 1991 to 2006. He resided in Mar 2000 in Gautier, Jackson Co, MS. He resided in Nov 2006 in Gautier, Jackson Co, MS. He was a member of American Legion Post 1992. Charles married Elsie Mae SHAPLEY on 18 Feb 1972 in El Paso Co, TX. 12050 F i Charlene Wendie BITLER. Charles also married Leona "Lee" about 1984. Keith Allen GRIDER 1, 2, 3 was born on 8 Jun 1969 in Newport, RI. He died on 9 Mar 2000 in Pascagoula, Jackson Co, MS. He was buried on 14 Mar 2000. Keith was a member of First Baptish Church in Gautier, MS.
12053 M iv John DUPREE. 12054 M v Jerry DUPREE. 12055 M vi Shawn BITLER. 6762. Michael Thomas "Mickey" BITLER [scrapbook] 1, 2, 3 (Charles Whitman , Edwin Charles , Solomon , Samuel , Michael , Johannes ) was born on 19 Jul 1952 in Cleveland, Cuyahoga Co, OH. He died on 30 Mar 2011 in At Home, Analomink, Monroe Co, PA.
Mickey graduated from Newton High School in Newton, NJ. He resided in Nov 2006 in Analomink, Monroe Co, PA. He resided in Apr 2009 in PA. He worked as Maintenance && Service (20 yrs) with Blair Academy . He was a member of Analomink Rod and Gun Club (board member). He resided in Mar 2011 in Analomink, Monroe Co, PA. The cause of his death was Cancer. 12056 M i Michael Colin BITLER. 6765. 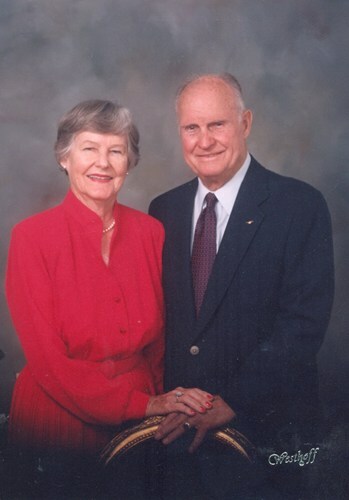 Joseph Cleve MOORE II 1, 2 (Mabell Ruth CATER , India Estell WHITESELL , Emily Elizabeth BITLER , Samuel , Michael , Johannes ) was born on 1 Jun 1928 in Kansas City, Jackson Co, MO. He died on 15 Oct 2002 in Hoopeston Community Memorial Hospital, Hoopeston, Vermilion Co, IL. He was buried in Floral Hill Cemetery, Iroquois Co, IL. Joseph worked as attorney. He worked as judge. He graduated from University of Missouri in 1950. He graduated with Juris Doctor from University of Missouri in 1952. He worked as mayor from 1961 to 1965 in Hoopeston, Vermilion Co, IL. He was a member of Hubbard Trail Country Club. He was a member of Hoopeston Rotary Club. He was a member of E&I Club of Hoopeston. He was a member of Vermilion County Bar Association (past President) in Vermilion Co, MO. He was a member of llinois Bar Association. He was a member of American Bar Association. He was a member of Missouri Bar Association. He was a member of Illinois Judges Association. He was a member of Danville Rotary Club. He was a member of Hoopeston Jaycees. He was a member of First Presbyterian Church of Hoopeston. Joseph married Marilyn M JANZEN on 4 Apr 1953 in Mobile, Mobile Co, AL. 12057 M i Joseph Grant MOORE. 12058 M ii Linden Martin MOORE. 12059 F iii Shirley Victoria MOORE. 6769. Robert Raymond YOUNT [scrapbook] 1 (Daisy Kathryn CATER , India Estell WHITESELL , Emily Elizabeth BITLER , Samuel , Michael , Johannes ) was born on 19 Sep 1922 in St Joseph, Andrew Co, MO. He died on 6 Dec 2009 in Bainbridge Island, Kitsap Co, WA. Robert resided in 1930 in 3201 Gene Field Rd, Washington Twp, Buchanan Co, MO. He served in the military with U. S. Navy - Captain (31 yrs) from 1941 to Jul 1973 in WW II, Korea, Viet Nam. He was issued a social security number before 1951 in MO. He resided in 1973 in San Diego, San Diego Co, CA. He resided in 2003 in Seattle, King Co, WA. Robert married Phyllis FRAZIER [scrapbook] 1, daughter of Robert FRAZIER and Elizabeth JACKSON, on 2 Nov 1947. Phyllis was born on 28 Mar 1924 in Hawaii. She died on 10 Jan 2010 in Bainbridge Island, Kitsap Co, WA. Phyllis resided in 1924 in Honolulu, HI. She was issued a social security number before 1951 in HI. She graduated from Punahou School in Hawaii. She graduated from Pomona College in Hawaii. She was a member of Navy Relief Society (1000 hr of service ward recipient). She resided in 1973 in San Diego, San Diego Co, CA. She resided in 2003 in Seattle, King Co, WA. + 12060 F i Kathryn Ann "Kitty" YOUNT was born on 25 Nov 1952. She died on 13 Apr 2008. + 12061 M ii Robert YOUNT. + 12062 F iii Christine YOUNT. 6770. James Alfred CATER 1 (Franklin Clark CATER , India Estell WHITESELL , Emily Elizabeth BITLER , Samuel , Michael , Johannes ) was born on 12 May 1920 in Cook Co, IL. He died on 9 Mar 1968 in Olmsted Co, MN. James was issued a social security number before 1951 in IL. James married Eleanor Mildred WANDERER, daughter of Walter Henry George WANDERER and Anna May PILZ. Eleanor was born on 26 Jul 1921 in Oak Park, Cook Co, IL. She died on 4 Mar 2005 in Schaumburg, Cook Co, IL. 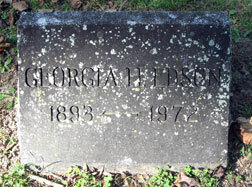 She was buried in Chapel Hill Gardens West. + 12063 F i Linda K CATER. + 12064 M ii James C CATER. 6771. Edwin Gex WILLIAMS Jr (Edwin Gex Whitesel WILLIAMS , Anna Cathryn WHITESELL , Emily Elizabeth BITLER , Samuel , Michael , Johannes ). Edwin married Elizabeth Ann MORRISON "Betty". + 12065 M i Edwin Gex WILLIAMS III.